reggae « DON’T ROCK N ROLL NO! 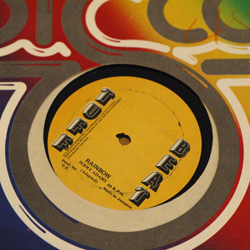 Published on February 18, 2008 in 12", 80s, music and reggae. Closed Tags: 1980, reggae, smooth, tt. Smooth reggae groove with some nice synthy effects. Honestly, though, I just think this one is a great song. This one is also produced by T.T., who I noted in drnrn!’s first real post. I’ve managed to track down several other cuts produced by this guy, and I’ll post some more soon. This, I think, is the most traditional one I’ve got. Published on November 18, 2007 in 80s, music and reggae. 1 Comment Tags: , 198?, dance, dollar records, dub, reggae, single. I’m always trying to track down cheap 80s reggae & dub 12″ singles, and I think finding this one for 99cents started it all. I got this in the old basement at Bleecker Street Records back when it was actually fun to shop there. 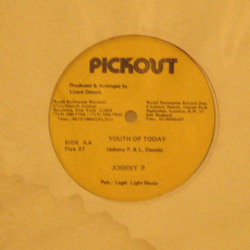 Anyway, this one, on Pickout Records, seems to be from the mid-80s. It’s produced by TT. I’ll be posting more from both TT and Johnny P soon, but I don’t want the island music to dominate this spot. My apologies to those of you who heard this on the original Record Jumble disc I made a couple of years back… I’m using that disc for posts while I’m working out the process of getting this blog up and running. More newer old stuff soon.